INTRODUCTION: Postoperative leaks from laparoscopic Roux-en-Y gastric bypass represent the most frequent site for anastomotic leaks. Recent studies have reported the rate of anastomotic leaks in bariatric procedures to range from 1% to 5%. In this study, we examined the economic impact of anastomotic leaks in cost and hospital length of stay for bariatric procedures in the United States. METHODS: We identified a set of bariatric procedures most prone to leaks based on a survey of the literature and consulting with bariatric surgeons. We then developed a work structure for these surgeries as well as additional procedures that need to be done in the event of a post-operative leak. 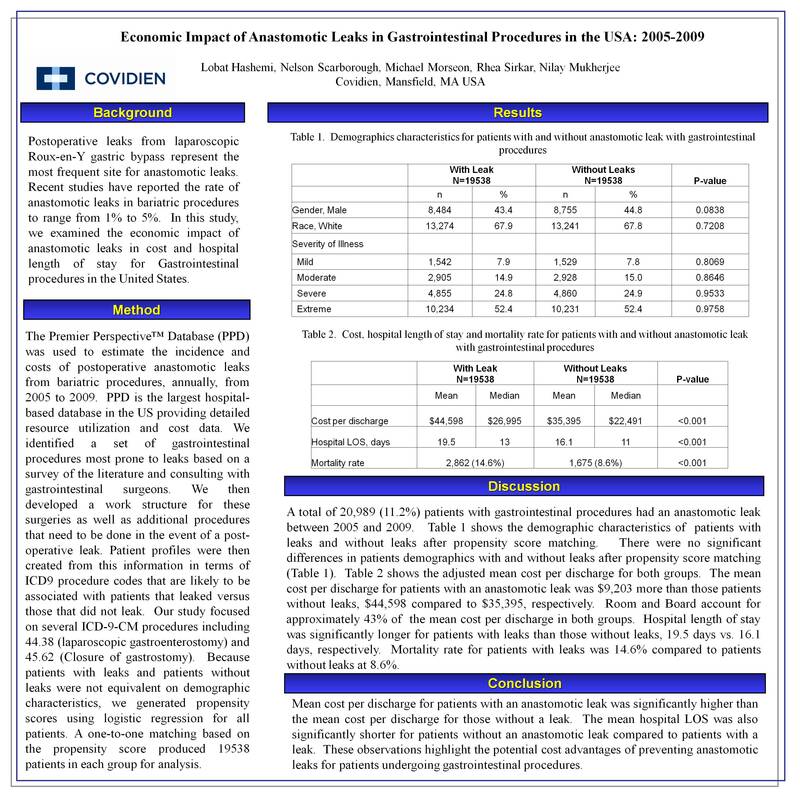 The Premier Perspective™ Database (PPD) was used to estimate the incidence and costs of postoperative anastomotic leaks from bariatric procedures, annually, from 2005 to 2009. PPD is the largest hospital-based database in the United States providing detailed resource utilization and cost. Our study focused on several ICD-9-CM procedures including 44.38 (laparoscopic gastroenterostomy), 45.62 (Closure of gastrostomy), 44.95 (laparoscopic gastric restrictive procedure), 44.39 (Other gastroenterostomy) and 44.67 (laparoscopic procedures for creation of esophagogastric sphincteric). RESULTS: A total of 21,089 (11.2%) patients with bariatric procedures had an anastomotic leak between 2005 and 2009. Table 1 describes the trend in volume, cost, and hospital length of stay (LOS) for bariatric patients with and without anastomotic leak from 2005 through 2009. The percentage of patients with an anastomotic leak increased from 2005 to 2006, but stayed relatively flat at 11.8% from 2006 to 2009. The mean cost per discharge for patients with an anastomotic leak was significantly higher than those patients without leaks each year. Patients with anastomotic leaks cost approximately twenty eight thousand dollars more than patients without a leak. Average hospital LOS was significantly lower for patients without leaks than patients with leaks, 6.7 days compared to 19.8 days, respectively. Average hospital LOS decreased slightly from 20.2 days in 2005 to 19.02 days in 2009 for patient with anastomotic leaks. Average hospital LOS also decreased for patients without leaks, from 7 days to in 2005 to 6 days in 2009. CONCLUSIONS: The percentage of bariatric patients with anastomotic leaks has stayed relatively constant at 11.8 percent between 2006 and 2009. Mean cost per discharge for patients with an anastomotic leak was significantly higher than the mean cost per discharge for those without a leak. The mean hospital LOS was also significantly shorter for patients without an anastomotic leak compared to patients with a leak. These observations highlight the potential cost advantages of preventing anastomotic leaks for patients undergoing bariatric procedures.